Castle Party Rentals offers the best mechanical bull at the best price! We carry insurance and have had our mechanical bull pass inspections by the state of Illinois. All of our mechanical bull rentals come with attendants to operate the ride. To make a reservation, please call (630)-400-6545. Looking for Mechanical Bull Rentals in Orland Park, Illinois? Castle Party offers mechanical Bull Rentals in Orland Park. We have the best mechanical bull rentals in Orland Park, Illinois. Our Orland Park Mechanical Bull Rentals are entertaining, affordable, and safe. Castle Party Rentals has the best price in Illinois, including Orland Park, IL. If you find a better price for a mechanical bull rental in Orland Park, Illinois, then we will beat it by 10%. We want to help you with you mechanical bull rental event. You deserve the most affordable mechanical bull rental for your Orland Park mechanical bull event. So saddle up, and give Castle Party Rentals a call at (630)-400-6545 and we can start planning your mechanical bull event. We are the largest mechanical bull provider in Orland Park, IL. No other company can compete with our mechanical bull quality and quantity. Our Orland Park mechanical bull rental is sure to entertain for hours on end. We have rented mechanical bulls to a variety of Orland Park clients such as schools, churches, corporations, and many private parties. Orland Park mechanical bull rentals are great for birthday parties, post proms, fun fairs, rodeos, western themed parties, weddings, graduation parties, reunions, bar mitzvahs, bat mitzvahs, and a variety of other celebrations. Regardless of theme, a mechanical bull rental is sure to make a lasting impression on all your guests at your next Orland Park mechanical bull rental. Looking for a mechanical bull rental in Palatine, Illinois? Then you have come to the right place. Castle Party Renals & Entertainment offers a variety of mechanical rentals to satisfy your budget and entertainment needs. By offering the most affordable rates in Palatine, more and more people are able to afford a mechanical bull rental in Palatine, Illinois. Our mechanical bull rentals come with 2 attendants, digital counter, inflatable safety mat, the bull itself, and hundreds of memories. Algonquin mechanical bull rentals are great for a variety of events. Our mechanical bull rentals have been featured at a variety of venues across Palatine, IL such as schools, bars, clubs, office buildings, parks, banquet halls, etc. Regardless of the type of event, an Palatine mechanical bull rental will satisfy party guests for hours on end. We are the leading mechanical bull rental company in the Midwest and are proud to offer such a great form of entertainment at such an affordable price to Palatine residents. Some great features about our mechanical bull in Palatine are that is has a variety of safety features like an automatic shut-off, inflatable safety mat, and a soft head. We care about your safety and that's why our Algonquin mechanical bull rental has been engineered to perfection. For all your mechanical bull needs in Palatine, please contact Castle Party Rentals at (630)-400-6545 and we will go above and beyond all your mechanical bull rental expectations. Looking for Mechanical Bull Rentals in Palos Heights, Illinois? Castle Party offers mechanical Bull Rentals in Palos Heights. We have the best mechanical bull rentals in Palos Heights, Illinois. Our Palos Heights Mechanical Bull Rentals are entertaining, affordable, and safe. Castle Party Rentals has the best price in Illinois, including Palos Heights, IL. If you find a better price for a mechanical bull rental in Palos Heights, Illinois, then we will beat it by 10%. We want to help you with you mechanical bull rental event. You deserve the most affordable mechanical bull rental for your Palos Heights mechanical bull event. So saddle up, and give Castle Party Rentals a call at (630)-400-6545 and we can start planning your mechanical bull event. We are the largest mechanical bull provider in Palos Heights, IL. No other company can compete with our mechanical bull quality and quantity. Our Palos Heights mechanical bull rental is sure to entertain for hours on end. We have rented mechanical bulls to a variety of Palos Heights clients such as schools, churches, corporations, and many private parties. Palos Heights mechanical bull rentals are great for birthday parties, post proms, fun fairs, rodeos, western themed parties, weddings, graduation parties, reunions, bar mitzvahs, bat mitzvahs, and a variety of other celebrations. Regardless of theme, a mechanical bull rental is sure to make a lasting impression on all your guests at your next Palos Heights mechanical bull rental. Looking for a mechanical bull rental in Park Ridge, Illinois? Then you have come to the right place. Castle Party Renals & Entertainment offers a variety of mechanical rentals to satisfy your budget and entertainment needs. By offering the most affordable rates in Park Ridge, more and more people are able to afford a mechanical bull rental in Park Ridge, Illinois. Our mechanical bull rentals come with 2 attendants, digital counter, inflatable safety mat, the bull itself, and hundreds of memories. Park Ridge mechanical bull rentals are great for a variety of events. Our mechanical bull rentals have been featured at a variety of venues across Park Ridge, IL such as schools, bars, clubs, office buildings, parks, banquet halls, etc. Regardless of the type of event, a Park Ridge mechanical bull rental will satisfy party guests for hours on end. We are the leading mechanical bull rental company in the Midwest and are proud to offer such a great form of entertainment at such an affordable price to Park Ridge residents. Some great features about our mechanical bull in Park Ridge are that is has a variety of safety features like an automatic shut-off, inflatable safety mat, and a soft head. We care about your safety and that's why our Park Ridge mechanical bull rental has been engineered to perfection. For all your mechanical bull needs in Park Ridge, please contact Castle Party Rentals at (630)-400-6545 and we will go above and beyond all your mechanical bull rental expectations. Looking for Mechanical Bull Rentals in Plainfield, Illinois? Castle Party offers mechanical Bull Rentals in Plainfield. We have the best mechanical bull rentals in Plainfield, Illinois. Our Plainfield Mechanical Bull Rentals are entertaining, affordable, and safe. Castle Party Rentals has the best price in Illinois, including Plainfield, IL. If you find a better price for a mechanical bull rental in Plainfield, Illinois, then we will beat it by 10%. We want to help you with you mechanical bull rental event. You deserve the most affordable mechanical bull rental for your Plainfield mechanical bull event. So saddle up, and give Castle Party Rentals a call at (630)-400-6545 and we can start planning your mechanical bull event. We are the largest mechanical bull provider in Plainfield, IL. No other company can compete with our mechanical bull quality and quantity. Our Plainfield mechanical bull rental is sure to entertain for hours on end. We have rented mechanical bulls to a variety of Plainfield clients such as schools, churches, corporations, and many private parties. Plainfield mechanical bull rentals are great for birthday parties, post proms, fun fairs, rodeos, western themed parties, weddings, graduation parties, reunions, bar mitzvahs, bat mitzvahs, and a variety of other celebrations. Regardless of theme, a mechanical bull rental is sure to make a lasting impression on all your guests at your next Plainfield mechanical bull rental. 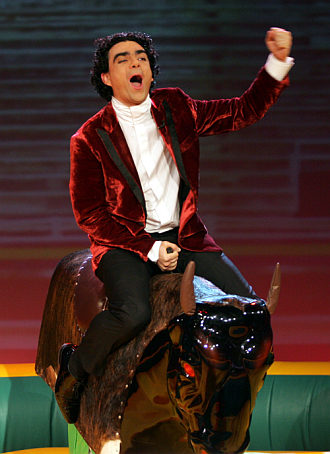 Looking for a mechanical bull rental in Rockford, Illinois? Then you have come to the right place. Castle Party Renals & Entertainment offers a variety of mechanical rentals to satisfy your budget and entertainment needs. By offering the most affordable rates in Rockford, more and more people are able to afford a mechanical bull rental in Rockford, Illinois. Our mechanical bull rentals come with 2 attendants, digital counter, inflatable safety mat, the bull itself, and hundreds of memories. Rockford mechanical bull rentals are great for a variety of events. Our mechanical bull rentals have been featured at a variety of venues across Rockford, IL such as schools, bars, clubs, office buildings, parks, banquet halls, etc. Regardless of the type of event, an Rockford mechanical bull rental will satisfy party guests for hours on end. We are the leading mechanical bull rental company in the Midwest and are proud to offer such a great form of entertainment at such an affordable price to Rockford residents. Some great features about our mechanical bull in Rockford are that is has a variety of safety features like an automatic shut-off, inflatable safety mat, and a soft head. We care about your safety and that's why our Rockford mechanical bull rental has been engineered to perfection. For all your mechanical bull needs in Rockford, please contact Castle Party Rentals at (630)-400-6545 and we will go above and beyond all your mechanical bull rental expectations. Looking for Mechanical Bull Rentals in Rolling Meadows, Illinois? Castle Party offers mechanical Bull Rentals in Rolling Meadows. We have the best mechanical bull rentals in Rolling Meadows, Illinois. Our Rolling Meadows Mechanical Bull Rentals are entertaining, affordable, and safe. Castle Party Rentals has the best price in Illinois, including Rolling Meadows, IL. If you find a better price for a mechanical bull rental in Rolling Meadows, Illinois, then we will beat it by 10%. We want to help you with you mechanical bull rental event. You deserve the most affordable mechanical bull rental for your Rolling Meadows mechanical bull event. So saddle up, and give Castle Party Rentals a call at (630)-400-6545 and we can start planning your mechanical bull event. We are the largest mechanical bull provider in Rolling Meadows, IL. No other company can compete with our mechanical bull quality and quantity. Our Rolling Meadows mechanical bull rental is sure to entertain for hours on end. We have rented mechanical bulls to a variety of Rolling Meadows clients such as schools, churches, corporations, and many private parties. Rolling Meadows mechanical bull rentals are great for birthday parties, post proms, fun fairs, rodeos, western themed parties, weddings, graduation parties, reunions, bar mitzvahs, bat mitzvahs, and a variety of other celebrations. Regardless of theme, a mechanical bull rental is sure to make a lasting impression on all your guests at your next Rolling Meadows mechanical bull rental. Looking for a mechanical bull rental in Romeoville, Illinois? Then you have come to the right place. Castle Party Renals & Entertainment offers a variety of mechanical rentals to satisfy your budget and entertainment needs. By offering the most affordable rates in Romeoville, more and more people are able to afford a mechanical bull rental in Romeoville, Illinois. Our mechanical bull rentals come with 2 attendants, digital counter, inflatable safety mat, the bull itself, and hundreds of memories. 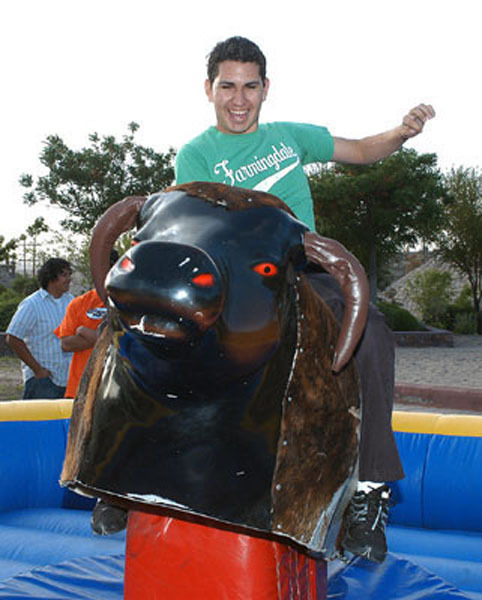 Romeoville mechanical bull rentals are great for a variety of events. Our mechanical bull rentals have been featured at a variety of venues across Romeoville, IL such as schools, bars, clubs, office buildings, parks, banquet halls, etc. Regardless of the type of event, an Romeoville mechanical bull rental will satisfy party guests for hours on end. We are the leading mechanical bull rental company in the Midwest and are proud to offer such a great form of entertainment at such an affordable price to Romeoville residents. Some great features about our mechanical bull in Bensenville are that is has a variety of safety features like an automatic shut-off, inflatable safety mat, and a soft head. We care about your safety and that's why our Romeoville mechanical bull rental has been engineered to perfection. For all your mechanical bull needs in Romeoville, please contact Castle Party Rentals at (630)-400-6545 and we will go above and beyond all your mechanical bull rental expectations. Looking for Mechanical Bull Rentals in Roselle, Illinois? Castle Party offers mechanical Bull Rentals in Roselle. We have the best mechanical bull rentals in Roselle, Illinois. Our Roselle Mechanical Bull Rentals are entertaining, affordable, and safe. Castle Party Rentals has the best price in Illinois, including Roselle, IL. If you find a better price for a mechanical bull rental in Roselle, Illinois, then we will beat it by 10%. We want to help you with you mechanical bull rental event. You deserve the most affordable mechanical bull rental for your Roselle mechanical bull event. So saddle up, and give Castle Party Rentals a call at (630)-400-6545 and we can start planning your mechanical bull event. We are the largest mechanical bull provider in Roselle, IL. No other company can compete with our mechanical bull quality and quantity. Our Roselle mechanical bull rental is sure to entertain for hours on end. We have rented mechanical bulls to a variety of Roselle clients such as schools, churches, corporations, and many private parties. Roselle mechanical bull rentals are great for birthday parties, post proms, fun fairs, rodeos, western themed parties, weddings, graduation parties, reunions, bar mitzvahs, bat mitzvahs, and a variety of other celebrations. Regardless of theme, a mechanical bull rental is sure to make a lasting impression on all your guests at your next Roselle mechanical bull rental. Looking for a mechanical bull rental in Saint Charles, Illinois? Then you have come to the right place. Castle Party Renals & Entertainment offers a variety of mechanical rentals to satisfy your budget and entertainment needs. By offering the most affordable rates in Saint Charles, more and more people are able to afford a mechanical bull rental in Saint Charles, Illinois. Our mechanical bull rentals come with 2 attendants, digital counter, inflatable safety mat, the bull itself, and hundreds of memories. Saint Charles mechanical bull rentals are great for a variety of events. Our mechanical bull rentals have been featured at a variety of venues across Saint Charles, IL such as schools, bars, clubs, office buildings, parks, banquet halls, etc. Regardless of the type of event, an Saint Charles mechanical bull rental will satisfy party guests for hours on end. We are the leading mechanical bull rental company in the Midwest and are proud to offer such a great form of entertainment at such an affordable price to Saint Charles residents. Some great features about our mechanical bull in Saint Charles are that is has a variety of safety features like an automatic shut-off, inflatable safety mat, and a soft head. We care about your safety and that's why our Saint Charles mechanical bull rental has been engineered to perfection. For all your mechanical bull needs in Saint Charles, please contact Castle Party Rentals at (630)-400-6545 and we will go above and beyond all your mechanical bull rental expectations. Looking for Mechanical Bull Rentals in Schaumburg, Illinois? Castle Party offers mechanical Bull Rentals in Schaumburg. We have the best mechanical bull rentals in Schaumburg, Illinois. Our Schaumburg Mechanical Bull Rentals are entertaining, affordable, and safe. Castle Party Rentals has the best price in Illinois, including Schaumburg, IL. If you find a better price for a mechanical bull rental in Schaumburg, Illinois, then we will beat it by 10%. We want to help you with you mechanical bull rental event. You deserve the most affordable mechanical bull rental for your Schaumburg mechanical bull event. So saddle up, and give Castle Party Rentals a call at (630)-400-6545 and we can start planning your mechanical bull event. We are the largest mechanical bull provider in Schaumburg, IL. No other company can compete with our mechanical bull quality and quantity. Our Schaumburg mechanical bull rental is sure to entertain for hours on end. We have rented mechanical bulls to a variety of Schaumburg clients such as schools, churches, corporations, and many private parties. Schaumburg mechanical bull rentals are great for birthday parties, post proms, fun fairs, rodeos, western themed parties, weddings, graduation parties, reunions, bar mitzvahs, bat mitzvahs, and a variety of other celebrations. Regardless of theme, a mechanical bull rental is sure to make a lasting impression on all your guests at your next Schaumburg mechanical bull rental. Looking for a mechanical bull rental in Skokie, Illinois? Then you have come to the right place. Castle Party Renals & Entertainment offers a variety of mechanical rentals to satisfy your budget and entertainment needs. By offering the most affordable rates in Skokie, more and more people are able to afford a mechanical bull rental in Skokie, Illinois. Our mechanical bull rentals come with 2 attendants, digital counter, inflatable safety mat, the bull itself, and hundreds of memories. 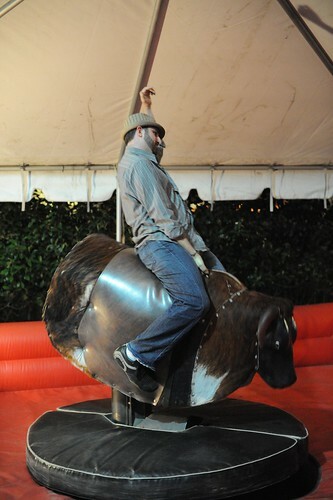 Skokie mechanical bull rentals are great for a variety of events. Our mechanical bull rentals have been featured at a variety of venues across Skokie, IL such as schools, bars, clubs, office buildings, parks, banquet halls, etc. Regardless of the type of event, an Skokie mechanical bull rental will satisfy party guests for hours on end. We are the leading mechanical bull rental company in the Midwest and are proud to offer such a great form of entertainment at such an affordable price to Skokie residents. Some great features about our mechanical bull in Skokie are that is has a variety of safety features like an automatic shut-off, inflatable safety mat, and a soft head. We care about your safety and that's why our Skokie mechanical bull rental has been engineered to perfection. For all your mechanical bull needs in Skokie, please contact Castle Party Rentals at (630)-400-6545 and we will go above and beyond all your mechanical bull rental expectations. Looking for Mechanical Bull Rentals in Sugar Grove, Illinois? Castle Party offers mechanical Bull Rentals in Sugar Grove. We have the best mechanical bull rentals in Sugar Grove, Illinois. Our Sugar Grove Mechanical Bull Rentals are entertaining, affordable, and safe. Castle Party Rentals has the best price in Illinois, including Sugar Grove, IL. If you find a better price for a mechanical bull rental in Sugar Grove, Illinois, then we will beat it by 10%. We want to help you with you mechanical bull rental event. You deserve the most affordable mechanical bull rental for your Sugar Grove mechanical bull event. So saddle up, and give Castle Party Rentals a call at (630)-400-6545 and we can start planning your mechanical bull event. We are the largest mechanical bull provider in Sugar Grove, IL. No other company can compete with our mechanical bull quality and quantity. Our Sugar Grove mechanical bull rental is sure to entertain for hours on end. We have rented mechanical bulls to a variety of Sugar Grove clients such as schools, churches, corporations, and many private parties. Sugar Grove mechanical bull rentals are great for birthday parties, post proms, fun fairs, rodeos, western themed parties, weddings, graduation parties, reunions, bar mitzvahs, bat mitzvahs, and a variety of other celebrations. Regardless of theme, a mechanical bull rental is sure to make a lasting impression on all your guests at your next Sugar Grove mechanical bull rental.